[New/Limited for 2013, Full time in 2015] So deep down I'm always looking to fill the void created my beloved blue bunny sedona sandwiches. Could this surprise limited edition flavor from Skinny Cow do it? It's rare to see an oatmeal wafer, and then they are mixing it with a cinnamon light ice cream? Sure it's low fat, but I gotta say, I'm excited. Here's the box of 6 snickerdoodle ice cream sandwiches just waiting for me to try them. 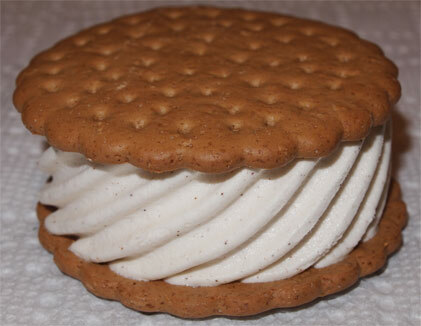 They are cinnamon low fat ice cream swirled between oatmeal cookie wafers. Yes, I said oatmeal, but hey, it's not vanilla or chocolate, so we might have something here. Now Skinny Cow teased these new limited edition sandwiches just last week so it felt pretty cool to find them already. Oh, an notice I didn't say "slimited" edition. Thankfully Skinny Cow has ditched that silly moniker. Clear wrapper removed -- Nice, it really smells like an oatmeal cookie (freshly dunk in 2% milk ofcourse). Now the wafer is a little strange looking. It's smooth yet has these tiny divots (as opposed to some rough oatmeal cookie). Actually, it kind of reminds me of Newton Fruit Thins. You'll also notice bits of what I can only assume are cinnamon in the ice cream. I take my first bite and it almost has a gingersnap taste to it. I take another bite and the cookie definitely has a little kick to it. I'll have to read the ingredients because something is messing with my taste buds here. The cookie is somewhat squishy but that's fine. It may look a bit thin, but it's packing a ton of flavor. I take a few bites of just cookie and it's not bad at all, plus it leaves some plain ice cream exposed.... wait is that burn coming from the ice cream? Nah.... it's my mind messing with me at this point right? You know, when bitten together, you kind of forget it's low fat. There's enough texture and flavor coming off the wafers to mask the usual flaws a light ice cream might have. When companies try things like this, it's how they grab new customers. "Innovate or die tryin" as they say... or maybe I heard that in a movie. Ok, there's that burning again... let me take the last bite and go check the ingredient list. reading... reading... doh, they put molasses in the oatmeal wafers, why would they do that? I love a good oatmeal cookie and I'm offended they would slap some molasses in there. Don't get me wrong, I do get it. You throw in that little pop to try and tie things together. You give that molasses kick since you can't really deliver that oatmeal crunch, but it just doesn't work for me. I've never liked molasses in my cookies so how can I truly endorse this one? On Second Scoop: ok, time to bring in backup on this one. I split one sandwich with my daughter and hand another sandwich over to my wife. My daughter basically says that it's not terrible, but she wouldn't purposely eat it either. My second scooping isn't as shocking at the first. In fact, I kind of ate it quickly so that the molasses burn wouldn't get to me (though it's still attempting to attack in the aftertaste). Now my wife is a fan of molasses (gingersnaps in particular) and she says.... well, let's put it this way, she says she's ok if I don't buy them again. Oh well, we tried. I know I don't love this treat, but I still think it will catch on and hopefully lead to further creative products from Skinny Cow. Did you see the other new flavor of Skinny Cow sandwiches? They are a Pink Velvet ice cream (no idea what flavor that is) with a creme cheese coating. Very girly; your daughter may get a kick out of them. Glad you all survived the snowstorm! yup, i've seen those pretty in pink bars in a few stores. I'm curious to know what "pink velvet" is, but I'm a little afraid as well. I don't eat chocolate, so I was ecstatic to find these. I simply LOVE them! I am not averse to molasses (and didn't even notice it, truthfully). The ice cream is so creamy and flavorful, and the cookies are perfect and chocolate-free. I'm kind of sad they're limited... but then again, that might be a good thing for me! I've had the pink velvet bar and thought they tasted a bit like frosting. I really liked the Slimited Cherry and Chocolate cones though. I've not seen the Snickerdoodle flavor yet, but I can't wait to try them. I think these are AMAZING. I literally have to stop myself from eating 2. I also didn't notice the molasses, but I love gingersnaps. and I dont know why they added molasses, because neither one of those cookies call for that. It was probably used just for the shell of the ice cream sandwich. I dont know if I really want to try them when a kid says, they are "just okay"
still puzzled on what made you think this was oatmeal? I said oatmeal because THE BOX says oatmeal. I know what a snickerdoodle is, you know what a snickerdoodle is, the box does not know what a snickerdoodle is.